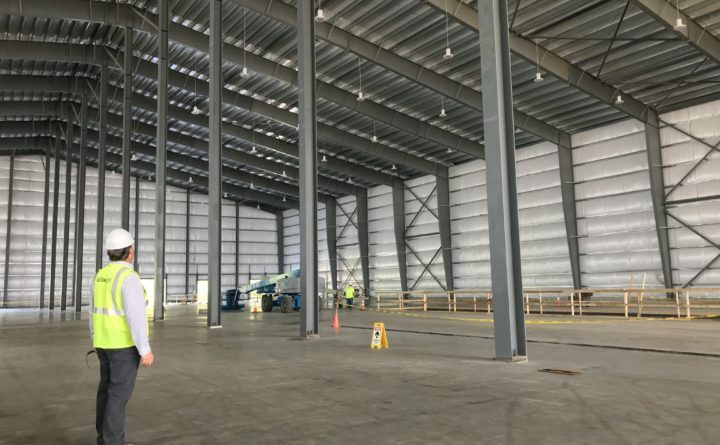 Fiberight CEO Craig Stuart-Paul stands on newly-laid concrete and looks up at light fixtures inside the Hampden Fiberight plant, which is still under construction. Stuart-Paul expects to begin processing recyclables in the fall. LED light fixtures that will eventually hang from the ceiling in the Fiberight waste-to-biofuel processing plant. 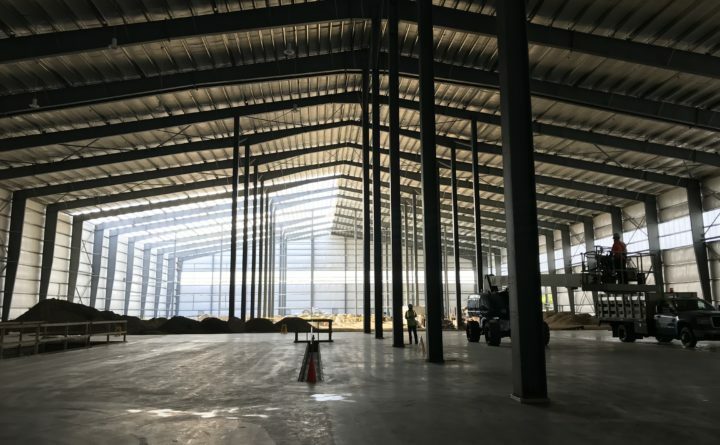 About 72,000 square feet of concrete flooring has been laid in the 144,000 square-foot Fiberight facility in Hampden. The remainder will be installed in the next month. Half of the floorspace is no longer dirt at the Fiberight waste-to-biofuel facility in Hampden, and recycling equipment will begin arriving Friday, a Fiberight official said. 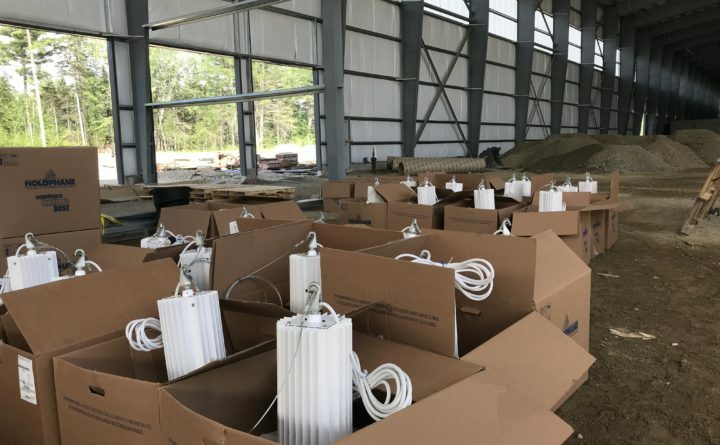 About 72,000 square feet of concrete flooring has been poured and a few dozen LED lights have been hung from the ceiling since June, Fiberight CEO Craig Stuart-Paul said Tuesday during a tour of the 144,000-square foot processing plant. Once the recycling and sorting equipment is assembled, that portion of the facility will begin processing waste in October, Stuart-Paul said, and not September as he previously thought. “I would’ve preferred we would’ve had more equipment in by now. In Maine, you have a very short construction season,” he said. Construction began last July, and Fiberight was supposed to begin processing waste by April 1, but the $69 million plant off Coldbrook Road was far from complete. The 115 central, northern and Down East communities that form the Municipal Review Committee and are building the Fiberight plant have been forced to landfill their waste until it comes online. “We are excited that the facility is on target to start taking material from MRC members this fall,” he said. Crews will pour the concrete floor to completion during the next 30 days as more equipment arrives. Parts of a 600,000-gallon anaerobic digestion tank that were shipped from Europe are being stored at Cianbro in Brewer. The facility’s pulp washers have arrived and are sitting in the back lot of the plant. The whole plant won’t be fully operational until the beginning of 2019, Stuart-Paul said. When it opens, it will be the largest waste-to-biofuel plant of its kind in the country, able to process up to 180,000 tons of waste annually. Since April, some MRC members have criticized the board’s decision to landfill until the plant is ready. As an alternative, the MRC board of directors in early June granted a temporary waiver for communities to pay more and send waste to the Penobscot Energy Recovery Co. in Orrington if they wanted to, where it would be processed into electricity. So far, Lounder said, no MRC communities have chosen that option.